This month marks our 16th anniversary. I thought it would be fun to tell our love story. 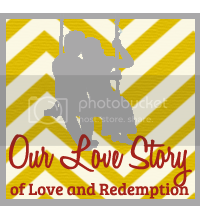 :) Its a bit unconventional but its ours, a real life story of Gods grace, love, and redemption. I was raised in a strict Christian home, grew up in a small farming town South of Portland, Oregon. My dad worked a lot in order to pay the bills and my mom homeschooled my brother and I through high school. I was taught that you didn't date and when the right guy came along Dad would take care of it. He was raised in a Christian home, grew up in the same area, part of the time on a farm, and later moved into town. He too was homeschooled except for two years at public school and a year at private school. He had two sisters and four brothers. One Sunday in October, 1988 a new family walked into the church I'd grown up in. They weren't hard to miss as they took up an entire pew with their seven children. My mother had introduced herself quickly and found they had a daughter she was sure was my age. After meeting them all with an awkward hello as any 10 year old would have I went off with my friends chattering about that new family with so many kids. Fast forward a couple weeks and somewhere along the way our family was invited over dinner. I'll never forget it. I'd been to many friends houses for dinner but this was different. Tanya could cook like nobody's business. (Its funny recounting this story being on this side of things now.) l instantly loved the activity that came with a large family, it was never boring and there was always someone to talk to or something to do. I became fast friends with Masha, (the girl my mother thought was my age but in reality was 5 years older then me) she liked to paint and do quirky things, she was cool, and the fact that she'd hang with me was even better. As time went on our families did more and more together, dinner, bible studies, homeschool activities, church, and youth get togethers. Going to the same church and being in the same circles lends to much time together. I always seemed to like hanging out with the boys more then girls. I was a bit of a tomboy growing up, climbing trees, shooting guns, hiking, and mucking in the barn was WAY more fun then sitting around doing nails or primping. (probably why Masha and I were friends, she wasn't into those girlie things either) I felt boys were easier to talk to and they didn't go around telling your secrets. It wasn't surprising after hanging out at that Shubin house so often that the nerdy boy with glasses that I wasn't so fond of back in '88 became my friend. Neither of us had a great first impression of each other but over time we kinda enjoyed each others company. too cute! can't wait to read part 2!